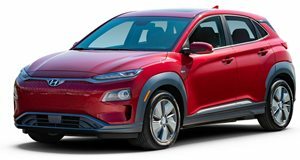 This isn’t Hyundai’s first EV, that honor goes to the Ioniq, but the Kona EV is Hyundai stepping to the front of the EV game in exceptional style. Based upon the standard Kona that launched last year, the Kona Electric lives up to all the hype generated before its release, combining a 201-horsepower electric motor with a class-leading 258-mile range, 100 miles greater than that of the Nissan Leaf. The motor drives the front wheels through a single-speed gearbox that enables hot-hatch goading performance, 80% charge is possible in under an hour, while a typical charge takes nearly ten hours. Priced between $36,450 and $44,650, there are three available trims, but all including the base SEL are extensively equipped with immense safety right from the entry model. 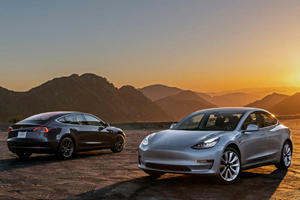 A few years ago, it seemed no one would come close to doing what Tesla has done in the EV game. The Nissan Leaf, the BMW i3, they all tried but never came close. Hyundai’s own effort, the Ioniq is disappointing, and really the only glimpse we got of brilliance came as a surprise from Chevrolet, whose Bolt EV lept to the forefront of the compact EV game with Tesla-challenging range and impressive driving dynamics. No longer is the Bolt alone, though, as Hyundai has made huge strides since its early attempt with the Ioniq Electric. 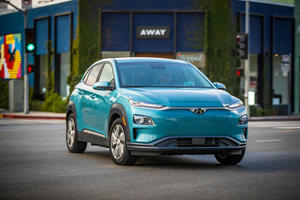 The Kona EV is fresh to the market for 2019, but goes 20 miles further on a charge than a Bolt, nearly matching the Tesla Model 3, all while packing the endearing traits of the gasoline-powered Kona launched last year. 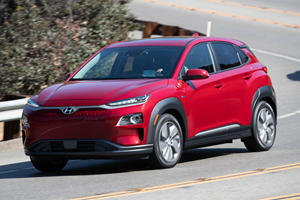 The non-electric Hyundai Kona has divided some opinions with its outlandish styling, and while the Kona EV is based on that, many of the outlandish traits have been ditched in favor of less divisive styling. The front end still features the slit-like eye LED daytime running lights that characterize the Kona, with a chrome blade running between the two housing the Hyundai badge. But the main headlamp clusters - projector headlights on the SEL and LED on Limited and Ultimate trims - are located beneath the LED DRLs and are housed in the front, body-colored front bumper, devoid of the black cladding seen on the standard Kona. Of course, another key difference to the front end styling is the lack of Hyundai’s cascading front grille. Instead, it’s reworked into hatch-patterned paneling that houses the charge ports for this electric version. The side profile is much the same as before, black cladding surrounds the wheel arches and lower sills, while a shoulder line runs the length of the body just above the body colored door handles blending into the leading edge of the wraparound taillights. The B-pillar is blacked out, and a horizontal black stripe splits the roof from the C-pillar to give it a floating effect. At the rear of the Kona Electric, the black stripe from the C-pillar broadens out to frame the rear windscreen. Meanwhile, the black cladding from the rear wheel arches extends back and around to encompass the lower light clusters that incorporate the rear turn signals. The cladding also extends from its lowest point right the way around the lower bumper, and as this is an EV, there are no exhaust tips anywhere in sight. The main taillight clusters are higher up than the lower, black-surrounded units and are narrow to mimic the front LED daytime running lights, and point inwards towards the Hyundai logo on the tailgate. Hyundai offers the Kona Electric in a color palette of five hues; Phantom Black, Chalk White, Pulse Red, Ceramic Blue, and Galactic Gray. On the SEL, the gray and blue hues are paired with a color-contrasting white roof, while the black paint job gets a gray roof, and the remaining paint colors are paired with a blacked-out roof. Of course, the Kona Electric’s drivetrain is what’s stolen headlines since information first arose. Key to the whole setup is a 64-kWh lithium-ion battery that’s liquid-cooled and operates at 356 volts. The battery powers a permanent-magnet synchronous electric motor that develops 201 horsepower and an astonishing 291 lb-ft of torque, which drives the front wheels. The battery system weighs less than 1,000 lbs, and the energy density is better than that of the Chevrolet Bolt. That’s not the only thing better than the Bolt, as the Kona Electric offers 20 miles more range on a charge than the Bolt does - achieving an EPA-rated range of 258 miles. That equates to 107 miles more than a Nissan Leaf and more than double the range of the VW eGolf, but it rivals the Tesla Model 3’s medium-range model, only short by six miles. That range is equivalent to an EPA-rated 120 MPGe combined figure. The Kona Electric features an onboard Level-II charging system capable of a 7.2kW rate of charge. It’s quick-charge enabled too, and on a Level-III quick-charge system, 80% charge can be recouped in 54 minutes. The standard Level-II charger takes just more than nine and a half hours. With 201 hp and an abundance of torque, the Kona Electric accelerates more like a hot-hatch than a crossover, capable of running the 0-60 mph sprint in under seven seconds. Whether powering up from a standstill, accelerating up to highway speeds, or overtaking, the Kona springs into action instantly and without reservation, aided ably by the Kona’s inherent lightweight body. Like the interior of the combustion-powered Kona, the interior of the Kona Electric is built to a budget, but done so in a manner that belies its budget nature with a sophisticated look and feel. But it is styled a little differently from its combustion-powered sibling, with the center console a little more prominent and the controls are laid out a little differently. Nevertheless, it’s as attractive as the standard Kona and the layout is intuitive. The driving position is impressive, with a decently supportive seat neither too firm nor overly bolstered. Multi-way adjustment, including standard height adjustment, ensures a position comfortable for drivers short and tall alike, while a standard tilt-and-telescoping steering wheel offers a good range of adjustment for all but the tallest of drivers for which it could extend just an inch or so further. There’s plenty of headroom and legroom for the front occupants, too, and visibility is great, with well-positioned roof pillars. Most vehicles in this segment are aimed towards singles or couples rather than full families, and the rear of the cabin reflects this. Space back here is a little limited, and although the rear bench is wide and headroom is surprisingly decent, the legroom is a little cramped for taller passengers, particularly behind a tall driver. Shorter rear passengers shouldn’t have too many complaints, and the cabin and seating are generally comfortable enough for longer journeys as well. The standard level of interior specification is high, too, and while cloth seating is standard on the SEL, the Limited and Ultimate boast leather upholstery and eight-way power adjustment. Other standard features include automatic temperature control, heated front seats, steering-mounted cruise controls, and on the SE and Limited models there’s a seven-inch touchscreen infotainment system with AM/FM/MP3 functionality, six speakers, SiriusXM satellite radio, and HD radio. The system also features standard Apple CarPlay and Android Auto functionality, dual front USB outlets and Blue Link Connected Car System with remote access to details such as the state of charge. On the Ultimate model, an eight-inch touchscreen features navigation and an Infinity eight-speaker premium audio system. While most EVs that share platforms with combustion-powered models tend to sacrifice cargo volume in favor of batteries mounted in the trunk, the Kona has been developed for EV use from the get-go. Impressively, it matches the standard Kona for cargo volume, with 19.2 cubic feet available behind the rear seats, less than the Nissan Leaf, but 2.3 cubic feet more than the Chevrolet Bolt. That standard figure isn’t massive, and it won’t accommodate more than a single large suitcase, but it will comfortably house several small cases for a weekend away. The rear seatbacks do fold and feature a 60/40 split. When folded, they lie level with the trunk floor and enhance the available cargo volume to 45.8 cubic feet. Many similarly sized crossovers boast more, and even the Chevrolet Bolt is more practical with up to 56.6 cubic feet available. The Kona Electric does provide some versatility that others don’t with a dual-level cargo floor that holds numerous smaller items beneath the main cargo shelf. The hot-hatch acceleration is just the tip of the iceberg as the Kona Electric shows a breadth of driving ability. The steering is direct and precise, but it lacks feedback due to the electric power-assistance which does dull the driver’s sense of involvement. However, it’s more than easy enough to use and the Kona feels nimble in tight environments, and the weighting is light enough for easy town use. At higher speeds, it remains light, but that can be a little disconcerting. Surprisingly, the Kona Electric has an abundance of grip, despite the eco-focused fuel-saver tires typically not offering high levels of adhesion. Of course, you’d need to be pushing the limits of the Kona’s handling to find the limits of grip, which is something that comes surprisingly easily. It begs to driven swiftly, and when chucked about it responds deftly. It changes direction sharply and feels stable on all surfaces and bends. Multilink rear suspension, the same sort found in the all-wheel drive versions of the standard Kona, deals with all imperfections and mid-corner bumps with alacrity. The handling prowess doesn’t come at the expense of comfort, either. The ride is well composed and the Kona Electric features poise not often associated with a vehicle of this size. A large contributor to this is the battery weight being mounted low in the chassis, dropping the center of gravity substantially and settling things, but the tuning of the suspension can’t be lauded enough. A Chevrolet Bolt, for comparison, doesn’t handle nor ride this well, and for the same price, it features a less sophisticated suspension setup, too. The Kona Electric also seems to correct one of the faux pas of the standard Kona: braking. The regenerative braking has three levels of aggression, which allows for almost complete one pedal operation when set to their most vigorous state of regen. We say ‘almost’, as the regeneration fades off at five mph, necessitating the use of the brake pedal. Admittedly this isn’t a problem, and even when using it regularly the pedal feels firm and modulation is easy - integration between the regeneration and friction braking is far superior to the messy affair of some other EVs. The Kona Electric launches in 2019, and the combustion model has only been on sale for a year now, so it’s difficult to glean details as to its reliability. The battery tech is new, but Hyundai seems to have done its research, and the Ioniq has already done the grunt work as a first step into the EV world, so we hope for good things from the Kona Electric. There’s a lifetime battery warranty as standard, and Hyundai’s penchant for class-leading warranties is likely to continue here. The Hyundai Kona Electric is naturally more expensive than the combustion model - you’re paying for the technology after all. Prices start at $36,450 for the Kona Electric SEL, with the Limited priced at $41,150 and the Ultimate at $44,650. That undercuts the Bolt marginally at the base price, but the Ultimate is more expensive than the highest Bolt trim available. All three models feature the same battery and electric motor combination, so there’s no range or performance difference between them. Instead, the price differentiation is just limited to changes in specification. The SEL is equipped with cloth seating surfaces and a six-way manually adjustable driver’s seat, along with automatic temperature control, heated front seats, cruise control, Bluetooth, and a seven-inch touchscreen infotainment system with Android Auto and Apple CarPlay functionality. Exterior features exclusive to the SEL are projector headlights, while all models boast 17-inch alloy wheels. Standard safety on the SEL includes forward collision warning, automatic emergency braking, adaptive cruise control, lane keep assist, blind spot monitoring with rear cross-traffic alert, and a driver attention warning. It’s thoroughly equipped, which is just as well as this is the trim most will and should be buying. The Limited gets LED headlights with automatic high beams and a power tilt-and-slide sunroof outside, while inside there’s leather upholstery, power adjustment for the driver’s seat, an eight-speaker Infinity premium audio system, an auto-dimming rearview mirror, and wireless device charging. The Ultimate rounds out the range and loads the Kona Electric with automatic wipers, parking sensors, stop-and-go functionality for the cruise control, pedestrian detection for the forward collision warning, a heated steering wheel, ventilated front seats, a head-up display, and an eight-inch touchscreen system with integrated navigation. No longer is Tesla the only EV manufacturer capable of ridding drivers of range-anxiety that plagues the EV market. It’s remarkable that Hyundai’s second electric effort has taken such a great leap forward, but here it is, rivalling the Chevrolet Bolt. Its 258-mile range and 201 hp outputs are simply brilliant, while the handling makes the Kona an EV you can enjoy tossing about. Cargo volumes may be a little subpar, but then again, they aren’t entirely unusable, and they sacrifice nothing to the standard Kona. Truth be told, the Kona Electric is everything we’ve become accustomed to from the Chevrolet Bolt, but with higher levels of performance, comfort, ability, and range. The Kona Electric is a phenomenal progression of EV technology that finally makes the changeover from fossil fuels viable for the masses.